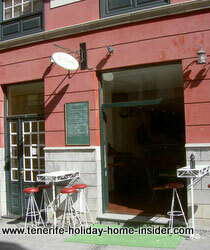 New business ideas by a cool bar of Puerto Cruz Tenerife Spain. New business ideas were not on our mind when my friend César and I strolled through the old tourist hub of Puerto de la Cruz Spain. César F.Real Real was merely interested to see how much the recession of 2009 had rubbed off on the oldest Tenerife resort. Then we discovered a real cool bar of Tenerife. The new business ideas which had been applied set it apart from others. A innocent enough cool bar with a small table and two chairs left the only clue pointing to a place for food and drink. Contrary to the impression, which you get from the image depicted beside, illumination was perfect to even shoot a photo inside. The brand new business innovation had only been introduced, a few days ago. The name display of La Ventita was still missing outside. La Ventita bar shop was a striking example of much business innovation of the year 2011. Just imagine, that its new business approach allowed for an old antique scale within a "new Millenium" shop. 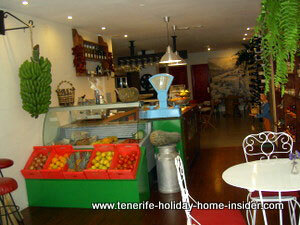 La Ventita bar had created a Tenerife shop at the same time. Therefore, as much a cool shop as a cool bar for tourists and locals alike had been born. 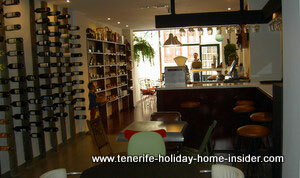 What made this Puerto Cruz small business venture for Tenerife shopping such a novelty which was unheard of? Drastic changes of times and circumstances caused new business ideas to be reinvented because of the new recession of 2009. Often, a new smart business begins after a stale money making venture had been closed down. However, it is irrelevant here, what was in the place of La Ventita before. Would you expect such strategies by a shop with bar around the corner from Calle Quintana? Therefor, guess how surprised we were, when a friendly lady of this smart business venture approached us. A long black waiter apron was part of her outfit. Perhaps nowadays, you noticed such clothes' accessories by waitresses. The color of that protective garment is a new fashion statement for new business ideas in Spain. The sympathetic Tinerfeña invited us in to see her cool bar La Ventita business innovation. Indeed, she was mighty proud of all the new business ideas which were put to the test inside. In fact, the ideas could not only be seen, touched, tasted and compared. They could even be bought. Don't we all want innovative gifts? Unfortunately this Tenerife bar of Puerto de la Cruz Spain is history now. It didn't stand the test of time, as the owners were not prepared to do any marketing. They sold violet petal jam which was an ideal gift. You could purchase Garchanzos pastry. This was a novelty which looked like a mousse made of flat yellow peas. Mind many more new business ideas were physically exhibited on La Ventita's shelves. They helped the adventurous shopper to score gifts they would have never dreamed about. Mind those banana farms, by the way... They leave more room for new business ideas, as they are an icon for everything tropical or subtropical, indeed. One of cool new ideas made use of the yellow fruit which is sent to some Tenerife hotels. The gift wrapped bananas are ready to take for the tourist who returns overseas. Most hotels offer this charming banana service to you. The brilliant method where many of the exquisite wines of the shop were held in best horizontal position took up minimum space. A fairly long bar was behind La Ventita's counter. A few tables with chairs were next to it. More display shelves, besides those for the novelty wine storage were on the wall opposite the bar. Those were indeed part of the best new business ideas of this shop. They were taking up a big wall surface, but no cubic meterage of this business novelty bar. There, you could encounter many little tapas for sale, as well. Most were in small glass containers. All of them looked like they harbored home made goodies inside. There is nothing new about selling Tapas in a shop. But there is always room for unheard of Tapas novelties, such as seen above. By the way, the above list is not showing the entire stock. In fact, César and I were overwhelmed by so much new and cool business innovation, as discovered in this Tenerife shop. However in vain, we expected future food novelties to crown the wall shelves of La Ventita Bar. This bar with shop was a real treasure trove of the wonderland of food. The little jars were perfect little party gifts to buy for celebrations. Sure, they also made good Tenerife souvenirs. In fact, the packaging and presentation of all the shop's products were eco friendly. Only glass and paper which may be recycled was part of them. Care for the environment which is taken seriously at Punta Brava of Puerto de la Cruz is a motto in this bar shop La Ventita of Spain. You could take a seat by the bar inside or outside. There you could sample a glass of Tajinaste wine. This Tenerife red wine from La Orotava has been much praised before by the web of the holiday home in Tenerife insider. 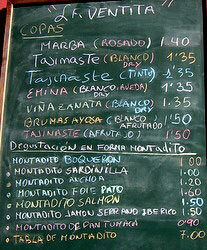 Discover the Tajinaste wine bar price of January 2011 displayed on the menu black board outside. 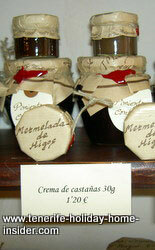 Also, there were some other goodies for sale in the shop of the numerous new business ideas Spain. 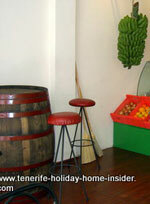 Everything remained to be discovered by the discerning guests of this Puerto Cruz Tenerife bar. Others introduced new business ideas, which may be dictated by public demand. Mind the placing of tables and chairs by the road side is one of them. The anti smoking law caused it. mind to leave off the brackets before hotmail. They were only put for scam bots. Unfortunately, the new shop La Ventita which was a little off the beaten track of the Puerto Cruz hub was not so easy to be found. Indeed, all its cool business ideas were wasted. Otherwise, that novelty store was a good example of smart business innovation. Even its name was good. In fact, it was cute. It's a mere foot massage of a new kind done in Tenerife South and Puerto Cruz, in the road. The massage is performed by special fish called Garra Ruffa who also clean old skin off the feet. The spa fish are imported from Istambul. 15 minutes treatment costs about €7 -- with fun. Explore another nearby suburb where new concepts to improve the economy are tried by many shops, service providers, bars and restaurants. The big Spanish business shopping center chain Alcampo had fun as a motto since 2011. Funky Tenerife events were part of its new business ideas. They were, shows with young models, to give just one example. The latest Tenerife new business idea of Puerto de la Cruz may not be the only one of its kind of innovative roof top additions for restaurants and bars, such as by Bar Restaurant Tapas La Cayaya and Restaurante La Cofradia. From new business ideas back to bars in Tenerife.